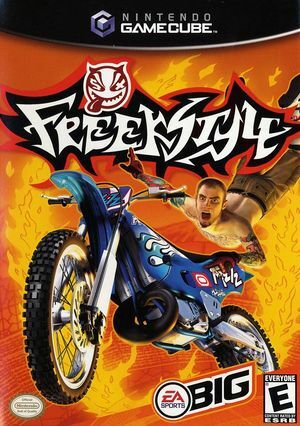 EA Sports Big, the label known for leading-edge extreme sports titles, speeds into the world of extreme motocross with Freekstyle 2002. If you don't have the guts to hit a 40-foot launch at 70 mph, you don't belong here, 'cause that's the only way to grab the big air you need to pull off 80 insane freestyle tricks. There's no room for fear. Real-life riders like Mike Metzger, Clifford "The Flyin' Hawaiian" Adpptante, and Jessica Patterson are available to choose from, each with his or her own bike, outfit, and riding style. Ride through nine venues looking for hidden shortcuts, or roam freely over the freestyle tracks. Master the moves to earn the points and speed boosts familiar to extreme sports games. You can also challenge a second player to race via split-screen. The graph below charts the compatibility with Freekstyle since Dolphin's 2.0 release, listing revisions only where a compatibility change occurred. This page was last edited on 16 January 2018, at 12:56.